I have been involved in Global Outreach for more than 20 years and I am still amazed at what an honor it is to follow Christ's commandments to "Go into all the world and make disciples of all nations BAPTIZING them in the name of the Father, and of the Son, and of the Holy Spirit, and teaching them to obey everything I have commanded you." Being one of the leaders of this Journey of Faith 2017 Healing Haiti team has truly been an honor and a joy. Even though this team has many A personalities on it Christ took those leaders and molded them into a well oiled cohesive serving machine. It has been amazing to see this team overcome adversity and pick up and support fellow team members. We front loaded many physical and emotionally stressful service opportunities at the start of the week and then added a time of relaxation and reflection at the end. Today we began the day in Grace Church. It was a joy to sit with some of the elders we served this week as well as some of the kids from Grace Village. It is amazing to see how Healing Haiti is now creating businesses which are already creating jobs and job training for many Haitians with Fleri Bakery, Fleri Resto, and now Fleri Farms. Not only is this creating an income source for their families but it is also teaching them how to work as a family and to stay as a family unit thereby decreasing the number of orphans and increasing self respect. Next, we did some shopping for those essentials and then up to the Observatory Restaurant. As we looked from the top of the mountain down into the valley of Port Au Prince and Citi Soleil where we have been serving all week. From this lofty perch the cool wind blew and eased our aching, tired bodies and all seemed alright but we knew all was not alright down in Citi Soleil and the valley below. Quiet reflection again reminded us how Christ is using Healing Haiti and teams every week to ease their thirst, plant a light house (Hope Church) in the center of the poorest slum in the Western Hemisphere on 18' of garbage, teach their children about Christ, and create jobs in a country with a 70% unemployment rate. This is Hope for Tomorrow! Today, two of my team members Chloe Basmajian and Brook Magpiong came to me, and asked me to baptize them. They both stated that it was important that they were baptized in Haiti as God had been speaking to their hearts all week and they wanted to do it in Haiti. We talked throughout the day and as a team we decided to do it. As an Ordained Chaplain I decided to do it in the pool at the hotel where we had been swimming in the evenings. We arrived and a DJ was playing and we asked if he could turn the music down while we conducted our baptism. He complied and it was a very special time for our entire team as well as the guests in the hotel to witness. I know the angels in heaven were just as joyful as Brook, Chloe and our entire team. 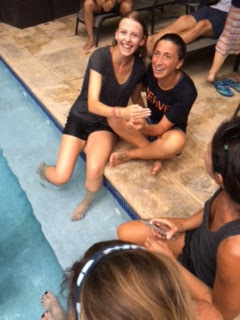 After the baptism, all of a sudden the DJ began to play the song Celebrate and the entire team sang and danced around the pool in celebration of the new life beginning of two amazing young ladies which truly reflect our week, "Hope For Tomorrow, New Life in Christ."